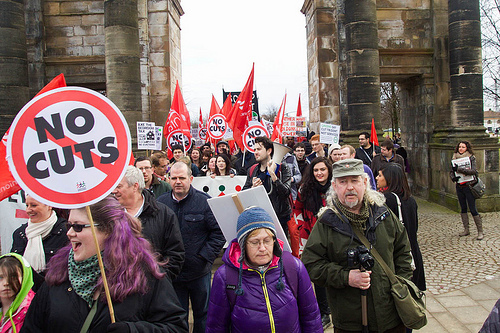 The Age of Austerity: Fighting Cuts and Privatisation — Nottingham Bedroom Tax Campaign! 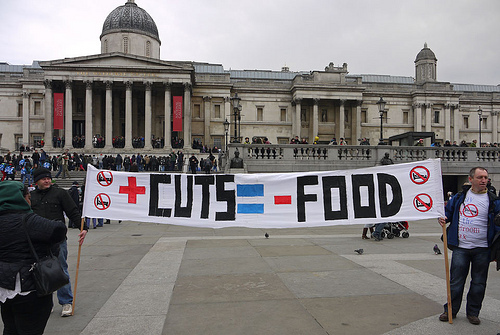 Austerity in the UK affects the public sector across the board, whether it is the National Health Service, Primary and Secondary Education, Further and Higher Education, disability services, social housing, etc. 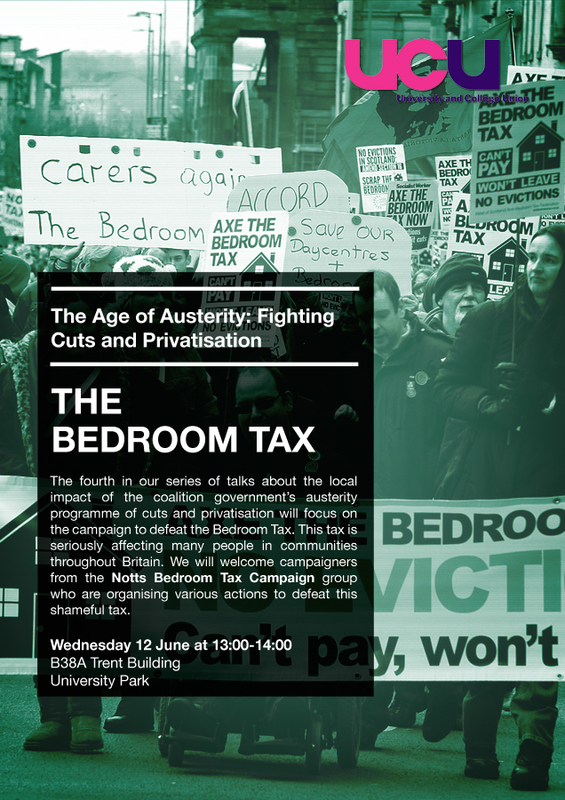 The fourth event of the series The Age of Austerity about Nottingham anti-cuts campaigns by the local UCU association at Nottingham University on 12 June dealt with the Bedroom Tax. It affects people in social housing, who are deemed to have a spare bedroom. Becky Kent and her mother Karen Wood spoke about the Nottingham Bedroom Tax Campaign, the devastating impact the tax has on people as well as the attempts to resist the attack on some of the most vulnerable members of society. The Bedroom Tax: a human perspective. Karen Wood, who had worked all her life until she became seriously ill, gave a powerful presentation on the human perspective behind the Bedroom Tax. Having already had her benefits cut by one-third due to the austerity agenda, she has now been hit by the Bedroom tax. Being asked to pay an extra £21 per week leaves her with £2.50 per week for groceries, toiletries, etc. The situation she faces is a choice between either paying the tax or continuing with her already very difficult normal life. But it is not only the harsh economic situation she is confronted with, it is the enormous stress resulting from the pressure to move, the general uncertainty about her future, as well as the daily worry whether another letter threatening eviction will be delivered by the post. It is the concerns for her severely ill son, which weigh heavily on her mind. He would have nowhere to go once he is out of hospital, if she had been forced to move out of a home, where she had lived for decades and brought up her three children. Listening to Karen Wood, it became clear why 53 year old Stephanie Bottrill saw no other way out than taking her own life, when hit by the Bedroom Tax (The Mirror). As Karen Wood made also clear, however, she does not see herself as a victim, because victims don’t fight back. She is determined to fight and defeat the tax. 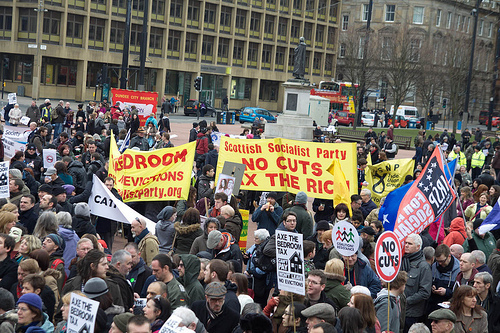 Economic nonsense and the attack on social housing: The real purpose behind the Bedroom Tax. Becky Kent, in turn, made clear that the Bedroom Tax does not make economic sense. As soon as tenants are £100 in arrears with their payments, eviction procedures are started. The overall process of eviction, costing several thousand pounds per person, is, however, much more expensive than the debt by tenants. Moreover, while 5500 homes in Nottingham are affected by the Bedroom Tax, there are hardly any properties available, in which people, who are asked to leave, could move into. Housing them then in private or temporary accommodation would again be much more expensive than what would be saved by avoiding these people’s debts from the tax. Additionally, it should not be forgotten that many tenants have lived in their houses for years and build up a local community network of support. Moving people would not only deprive them of their social environment, it would also require local Councils to provide expensive assistance for tasks, so far carried out by friends and neighbours. Clearly, taking all these factors together, the Bedroom Tax is not about saving money and reducing public debt. Yet again, as in the case of restructuring in education (see Hands off our Schools!) or privatisation of the NHS (see Broxtowe Save Our NHS), the real purpose is a market-based transformation of society. Social housing has been the target of Conservatives for some time and the current crisis gives them the pretext to undermine it severely. 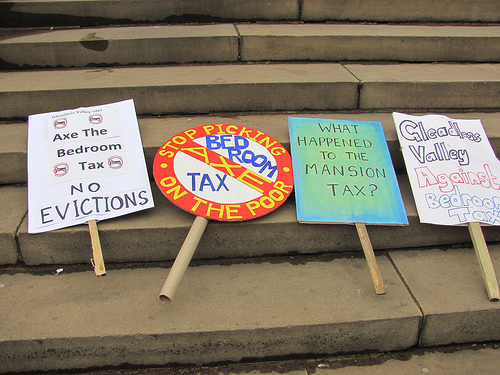 The Nottingham Bedroom Tax Campaignfocuses on providing information and support for people affected by the tax. For example, they provide detailed information about the process of eviction, helping people to understand that it is actually not that easy to throw people out. It is important for people to know that the first letter threatening eviction does not imply that they have to leave within the immediate future. The Bedroom Tax often affects some of the most vulnerable people in society, suffering from disabilities, long-term illnesses, mental health problems or a history of domestic abuse. Many have struggled for such a long time with difficult situations that they have become completely alienated from politics and find it often impossible to resist. The Bedroom Tax Campaign also provides a rallying point for these people to come together, regain confidence and develop collective agency in resistance. A key aspect of the Campaign’s strategy is to lobby and put pressure on Nottingham City Council, which is dominated by the Labour Party, to declare a no eviction commitment in relation to people, who are in arrears with their payments as a result of the Bedroom Tax. Broxtowe Borough Council has already made such a pledge, although there is only a small Labour majority unlike in Nottingham. Especially prior to the national general elections in 2013, it would be important to put pressure on the Labour Party, Becky Kent argued, to declare its position on the austerity agenda and the local level is the best place to start in relation to the Bedroom Tax. In order to sign a petition to Councillor Jon Collins, Leader of Nottingham City Council, click on the Bedroom Tax Petition. The Bedroom Tax is not the Poll Tax, Becky Kent concluded. Because it affects only a small part of society, unlike the Poll Tax back in the 1980s, it is much more difficult to mobilise widely. Support for the Campaign is therefore necessary and spreading information about this attack on vulnerable people remains a task of utmost importance. Ultimately, should it come to evictions in the end, the final moment of resistance will be to put up eviction pickets. Mobilisation for this clearly has to start now.